Drobo today announced the launch of the world’s first self-­managing USB-­C storage solution, the Drobo 5C. Built upon the company's BeyondRAID technology, the Drobo 5C allows the user to easily expand capacity by adding a mix of different size hard drives and brands, eliminating the limitations found in traditional RAID systems. The 5C, with an average performance of 250MB/sec, is ideal for storing all types of data, including pictures and video. The five-bay 5C, which uses the latest USB‐C interface to connect to your PC, is available for $349. Drobo is offering second and third generation Drobo 4 Bay customers a $50 USD discount when they purchase a new Drobo 5C through its online store. Drobo 5C offers more data protection and capacity, at a cost‐effective price. SANTA CLARA, CA. – October 4th, 2016 – Drobo, the maker of award winning storage arrays for businesses, professionals, and consumers, today announced the launch of the world’s first self-­managing USB-­C storage solution, the Drobo 5C. As devices and computers trend towards thinner and smaller form factors, the USB‐C interface will become increasingly prevalent. The 5C is designed to stay ahead of this trend by providing a smaller and sleeker interface while still delivering a powerful storage solution. The five bay 5C is priced at $349 and builds upon all the innovations of the original Drobo. Managing RAID technology can be extremely time consuming. Most storage arrays make the user perform complicated tasks, such as choosing from a confusing list of RAID levels or formatting file systems to setup their system. This can be intimidating for many users. Most users just want to store their data securely, without the complexities of RAID thrust upon them. The Drobo 5C solves these problems by automating the setup and management tasks. Built upon award-­winning BeyondRAID™ technology, the Drobo 5C allows the user to easily expand capacity by adding a mix of different size hard drives and brands. This eliminates the limitations found in traditional RAID systems. With Drobo, hard drives easily slide in without the need for carriers or screws. 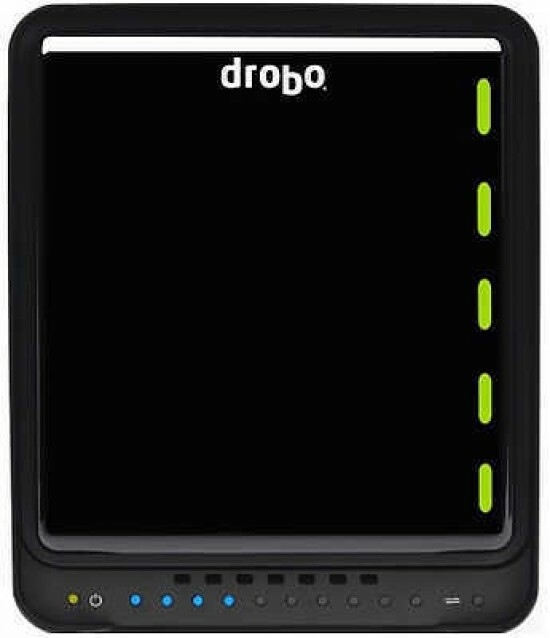 “Buying a storage solution can be intimidating,” said Mihir Shah, CEO of Drobo. The 5C uses the latest USB‐C interface to connect to all PCs and Macs. USB‐C is compatible with both USB 3.0 and USB 2.0. The 5C, with an average performance of 250MB/sec, is ideal for storing all types of data, including pictures and video. Setting up the 5C is effortless. The intuitive “traffic light interface” allows even the most novice user to be up and running in less than 10 minutes. The Drobo 5C will replace the original Drobo 4-­Bay that was first introduced 9 years ago. Over the past 9 years, Drobo’s read/write performance has increased 10x; storage capacity has increased 32x, while the list price has decreased 33%. This makes Drobo the leader in storage solutions for customers who want the optimal combination of price, performance, and simplicity. Contact partners@drobo.com for more information. Valid until Oct 11th, 2016. Drobo makes award‐winning storage arrays that provide an unprecedented combination of data protection, expandability, and ease of use.